Those gains, however, were substantial. Chávez’s revolution offered universal access to free health care. It built schools, abolished illiteracy, and reduced poverty by half and extreme poverty by more than 70%. NACLA Editorial Committee member Gregory Wilpert was interviewed yesterday by The Real News. Democracy Now! 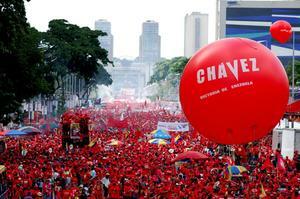 dedicated its entire show today to Chávez, Venezuela, and the Bolivarian Process (with guests Miguel Tinker Salas, Eva Golinger, Gregory Wilpert, Greg Grandin, and Michael Shifter). NACLA executive editor Greg Grandin has already written an insightful piece, “On the Legacy of Hugo Chávez,” for The Nation. 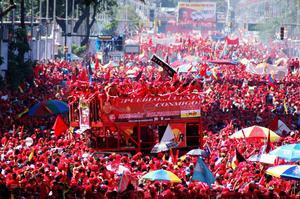 Chávez would attempt to empower communities and promote participatory democracy throughout his presidency. He called on workers to occupy their factories and supported the formation of tens of thousands of cooperatives. Chávez’s government called for the community to organize locally outside of bureaucratic channels and gave the people the tools to do it. Over 30,000 communal councils were created by neighborhood residents to make decisions about their own communities. These new councils could (and still can) receive funds directly from the national government to carry out their projects. Representatives were traded for spokespersons. Michael Fox is a former editor of NACLA Report on the Americas and a member of the NACLA Multimedia Team. He is most–recently the co-author of the new book Latin America’s Turbulent Transitions: The Future of 21st Century Socialism (Zed Books, 2013). Quinoa: ¿Será comprar o no comprar la pregunta correcta?